Mesa County's ongoing project to provide continuous pedestrian and bicycle structures along Highway 340 gets an addition. On the north side of Highway 340, between Mesa Grande Drive and Vista Grande Drive, a pedestrian bridge was added this week to improve pedestrian safety. The bridge will cross the Red Canyon drainage, which is approximately 200 feet west of the existing sidewalk on Highway 340. Installation of the prefabricated, 105-foot pedestrian bridge started Wednesday morning and is expected to be completed by summer 2017. In addition to the new bridge, the multifaceted project includes minor flood mitigation and minor stormwater improvements as well as connection to the Riverfront Trail. Construction crews prep the new Red Canyon Pedestrian Bridge for installation on the north side of Highway 340, between Mesa Grande Drive and Vista Grande Drive in the Redlands. The new bridge will aid in making Mesa County roads safer for all users. A crane lifts the new Red Canyon Bridge and meticulously proceeds to set it into place on the new abutments. Crew members help guide the crane operator to ensure the bridge aligns with the bolts on the abutment. The installation process of the Red Canyon Bridge took approximately two hours. 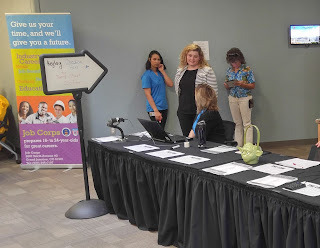 The bridge is set. A perfect fit! Residents can expect to see work continue on the newly installed pedestrian bridge over the Red Canyon drainage in the coming weeks. The bridge is estimated to open June of 2017. 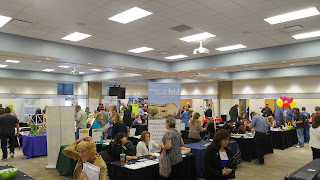 The length of Highway 340 is densely populated and serves schools in the Redlands area. Mesa County will continue to provide safety improvements to make our community safer for drivers, bicyclists, and pedestrians.The final phase of the project will add sidewalks from Vista Grande Drive to Kansas Ave. Construction is expected to begin in 2018. 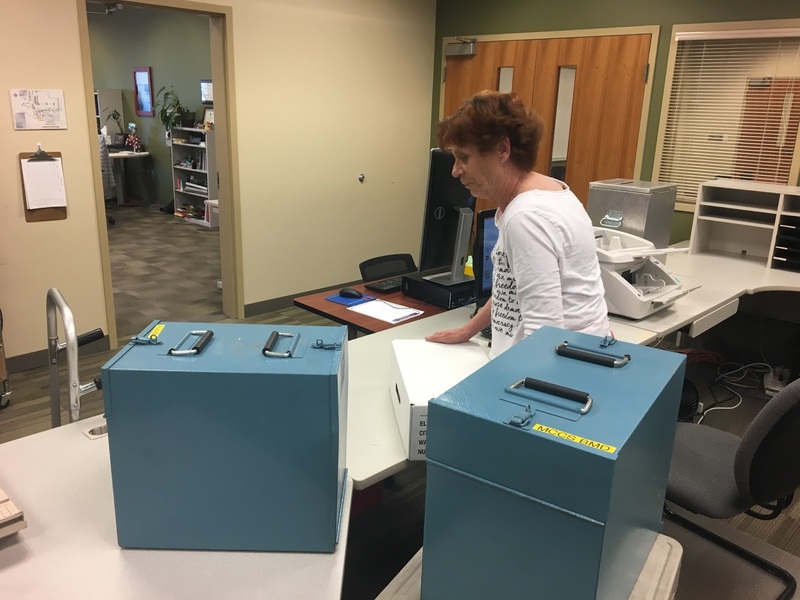 Mesa County Elections Technician Karen Reiher processes ballots. So far approximately 16 percent of voters have cast their ballot as of Thursday evening. 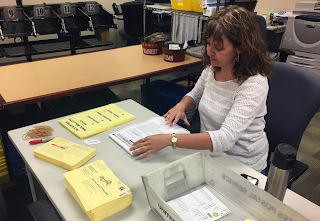 Mesa County Elections Operations Manager Patti Inscho works on tabulating ballots for the municipal election. 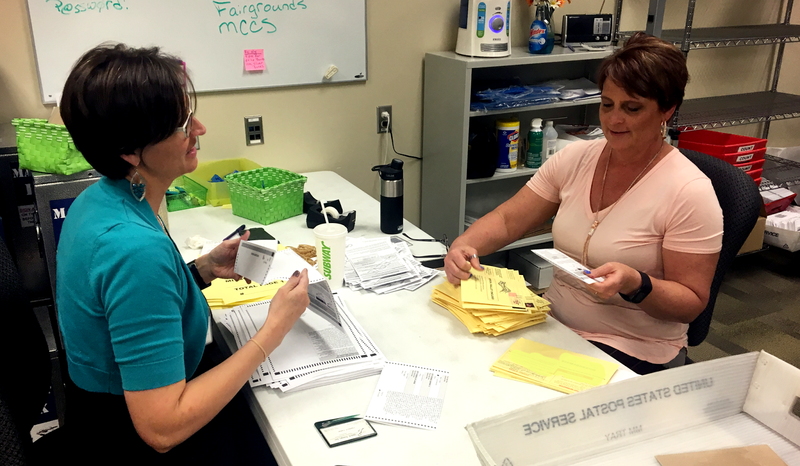 Mesa County Clerk and Recorder Sheila Reiner and Clerk and Recorder Division Director Jackie Campbell assist the elections office with opening ballots to ensure staff is not shorthanded. 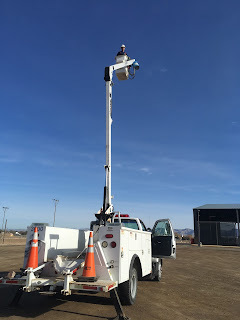 Mesa County Facilities staff member Kevin Eaton participates in a refresher aerial lift and bucket truck training. Only appropriately trained and authorized employees are permitted to operate aerial lift devices. 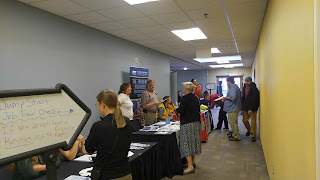 Mesa County Fairgrounds Event Coordinator Stacy Pinnt looks at the picture of her granddaughter hanging in her office. Pinnt's granddaughter was on the cover of the Mesa County Fairgrounds' program last year. 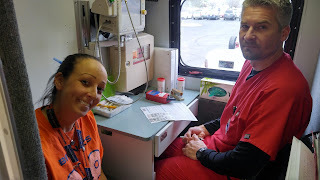 St. Mary's Blood Mobile Donation Day at Mesa County Central Services Building. 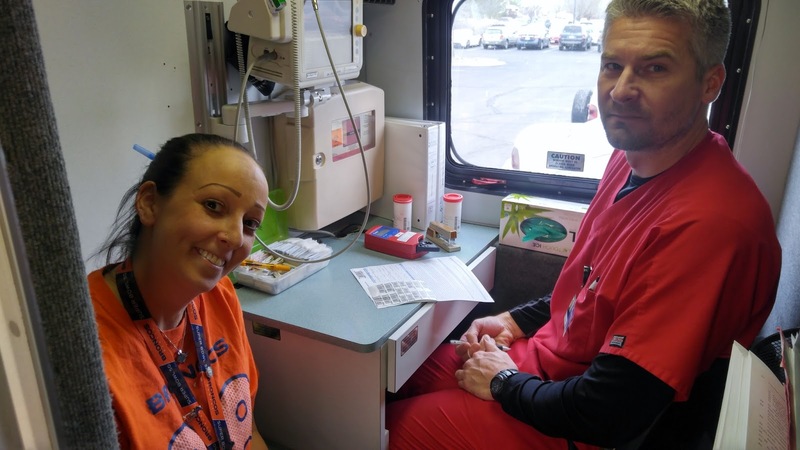 From left to right, April Puter, Mesa County Department of Human Services administrative team member, and St. Mary's blood draw Staff. Mesa County Department of Human Services Long-term Care Liason Ashley Mow fills out paperwork before donating blood. Annual Jump Start Job Fair at the Mesa County Workforce Center on Tuesday. 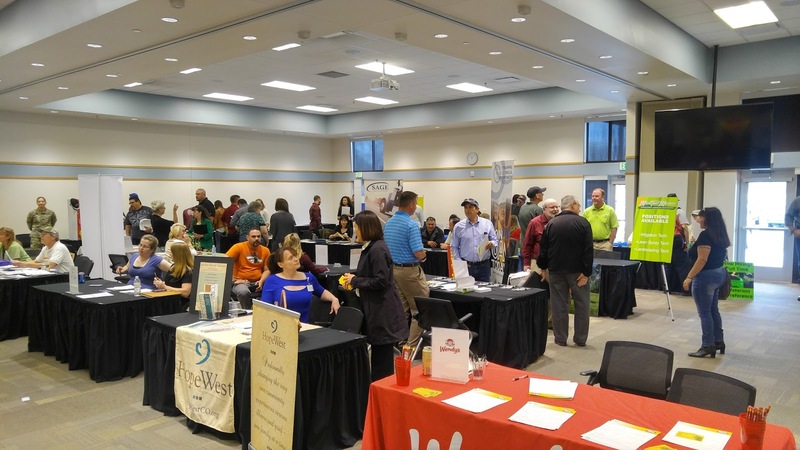 The Annual Jump Start Job Fair at the Mesa County Workforce Center attracted over 370 job seekers. Nearly 50 employers participated at this year's Mesa County Workforce Center Job Fair. To date, the 2017 Job Fair drew more business participation than ever before. Mesa County Public Health Data Analyst Shane Chatfield administers Bitrex to Information & Communication Manager Katie Goddeyne during the sensitivity testing portion of Katie's fit testing. 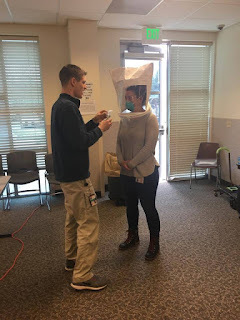 Staff were fit for respirators, which would be utilized in the case of an emergency in which MCPH officials needed to respond. 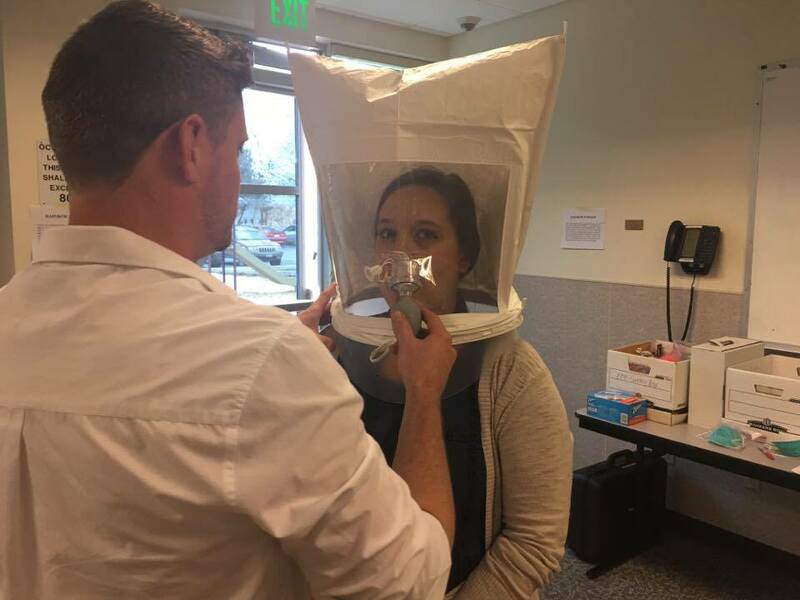 Epidemiologist Andy Tyler fits Child Care Licensing Specialist Audrey Osgood during the fit testing on Thursday.